“America first” and “to hell with the rest of the world”! One single stroke of hand, one signature, and over 1,000 hardworking people in Bali, Indonesia, suddenly ended up on the pavement. No second thoughts, no mercy. American savage capitalist ways met and embraced that fabled Indonesian feudalism, which was implanted into this country several decades ago, precisely after the 1965 military coup sponsored by the West. U.S. President Donald Trump, always on the lookout for some great business opportunities, finally found one in Bali (and one more in West Java), a tropical, once paradise-like Indonesian island. And not just somewhere in Bali, but right next to the holiest and the most spectacular Hindu temple in the country, Tanah Lot. It is true that he was not the first one determined to destroy the area. An enormous hotel and golf resort, Le Meridien teamed up with several Indonesian businesses, and perpetrated a land grab, forcing out thousands of local people. That was a long time ago. Then the Pan Pacific hotel chain moved in, purchased the property, and is running it to this day. 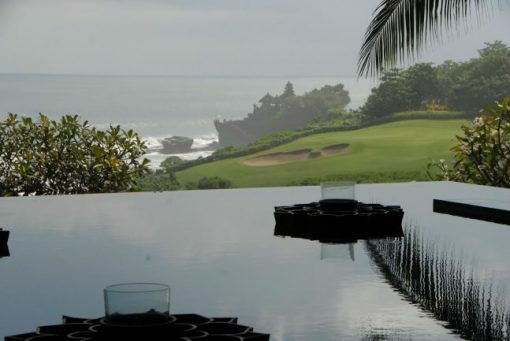 However, Mr. Trump is now planning something truly monumental here, in the middle of the iconic rice fields and dormant rural countryside: a shout of hedonism, a 6-star opulent, a concrete monstrosity, which will certainly and irreversibly dwarf the local culture and the traditional Balinese aesthetics. Mr. Trump teamed up with Hary Tanoesoedibjo, an unsavory and ruthless Indonesian businessman. It is actually feared by many that Mr. Tanoesoedibjo (and others around him) are now manipulating Indonesian politics, on behalf of the West, trying to eliminate progressive elements that have managed to enter (some say ‘miraculously’) the Indonesian government. It is also no secret that Mr. Tanoesoedibjo himself has high political ambitions, and will most likely be running for the post of president. The US geopolitical interests, as well as the interests of the local business “elites”, have always been directly antagonistic to the interests of the Indonesian poor (still the great majority of the country’s population). I have been employed by this property for more than 20 years. First it was Le Meridien, now it is Pan Pacific. Soon the hotel will be closing down. I was told this on the February 14, 2017, on Valentine’s Day. I was devastated. I just took a bank loan of Rp. 60 million (US$4.000), for the education of my child, and I had only managed to pay one single installment, before hearing ‘the news’. How will I be able to repay that loan if I lose my job in July? I feel very scared and very sad. I am a single mother; my child is still in junior high school. I cannot rely on anybody else. I heard that we would only get severance pay of Rp. 40 millions (US$3.000). And that is after 20 years of service. Our union here is still trying to negotiate to get at least Rp. 100 millions, but I’m not sure they will succeed. This land is now owned by Hary Tanoe and Donald Trump. It is big – 103 hectares. I heard that they want to expand, to acquire more land that is still owned by the villagers. This new hotel will be huge, with 125 suites. They call it a 6 star property. And they’ll create a totally new golf course here. There was a deal, between the first owners and the employees. I checked. This deal will be now fully ignored by the new owners: Trump/Tanoe. I went to the surrounding villages, where everyone appears to be in total distress. The biggest problem with the change of ownership of the Nirwana Bali Resorts is that there will be more than 800 villagers who will lose their jobs. Some say over one thousand. When Nirwana Bali acquired our lands, we signed agreements that said: with each ‘ownership of land certificate’, the owners will provide 2-4 jobs to the families of the certificate holders. The new owners, Hary Tanoe and Donald Trump, simply do not intend to honor those agreements anymore. There is obviously nothing we can do about it. Our ‘warung’ will also suffer, when they close the hotel in July 2017. Some golfers are actually our customers. Now, for 3 years almost no one will be eating here. To put things into perspective: to protest or to defend one’s rights in Indonesia is extremely dangerous. People who dare to go against the ‘big interests’, often get beaten, they disappear, their houses are burned, wives and daughters raped. Three years is a long period of time, especially in a country where many are living from day to day, with no ‘reserves’ and no savings. Mr. Trump must know it, and, of course, he doesn’t care. They are not going to re-hire us, at least not people they will consider to be already ‘too old’ (I’m 43 years old now). They don’t care that we have worked here for 20 years and that this is in a way our second home. I’ll have to find another job. How, I don’t know, but I have to: I have a child to feed. We are all very sad and feel very uncertain. My son will go to university this year, but I am losing my job very soon. In the meantime, Bali is collapsing, like the rest of Indonesia. It is already ruined environmentally; it is infested by notorious traffic jams, pollution and lack of public spaces. During and after the Financial Crises of 1997-98, most of the Balinese families in the tourist areas were forced to sell their land. Instead of running their own businesses as before, local people are now mostly employed by big companies, either Javanese or foreign. Living conditions are tough. Idyllic, artistic and sensual Bali is basically gone. In a predominantly Muslim country, it still functions as some sort of a duty-free island, where alcohol and pork are widely available, and where clubs are open until the wee hours. There are also a few beautiful rice fields between the terrible urban sprawls with no sidewalks and no public transportation to speak of (still a norm for most of the cities in Indonesia). Instead of artists, writers and dreamers, Bali is now catering to mass tourism. One chain 5-star hotel after another is opening its doors, on the beaches and in the spectacular ravines. Instead of integrating themselves into the cultural and traditional landscape, these hotels are creating huge luxury “bubbles”, fully separated from the rest of the island. Now Donald Trump has found his niche. But what about the island, what about the villages and what about the people? All that, obviously, matters nothing! What will soon come up will be an enormous golf resort, next to the iconic temple, which is totally unique, in fact, it is an island during high tide, accessible only during those times of the day when the tide is low. But even the temple is already damaged; it is reinforced by badly poured concrete. It is surrounded by horrible eateries on the ‘shore’. Right before the sunset, hundreds of huge buses are bringing thousands of indifferent tourists for a quick glimpse. Nothing is serene in Bali anymore. 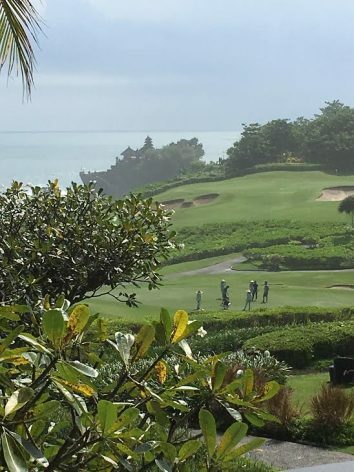 Paradoxically (but in a way logically by turbo-capitalist Indonesian standards), the greatest views of the temple will be ‘reserved’ for the richest of the rich, for those who will be able to afford to stay and to play at the luxury hotel and golf course owned by Mr. Trump. Somehow, at least to me, the advertisements of the future hotel look more like a requiem for the island of Bali. My history with Bali is long. I used to come here, periodically, to shut myself off from the world, and to write. Even when I used to live in my beloved Chile, I would fly to Bali, to the other side of the world, via Buenos Aires, Cape Town, Johannesburg and Kuala Lumpur. Bali used to be serene. It used to have soul – capricious, unpredictable, but soul nevertheless. I wrote my revolutionary novel, Point of No Return, in Ubud. Exile or Terasing! Di negeri sendiri, a book with Pramoedya Ananta Toer, the greatest Indonesian writer, and with Ms. Rossie Indira, was actually edited in Tanah Lot. I avoid the island now; I have done so for many years. I only come when some calamity occurs, or something truly significant. This time, the symbolism is clear: what is happening in Tanah Lot is indicating, brutally, although on a small scale, how the world and Indonesia will be governed from Washington, in the upcoming years. This article was posted on Tuesday, June 13th, 2017 at 9:45pm and is filed under Donald Trump, Indonesia.